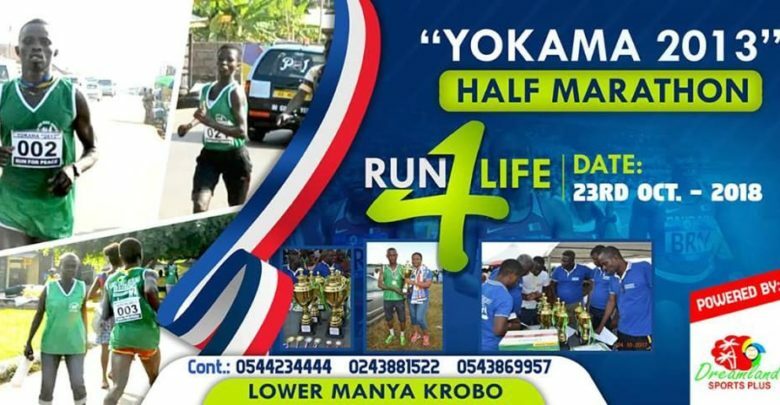 The “Yokama 2013” half marathon 2018 race comes on at Manya Krobo on October 23, 2018 in the Eastern Region of Ghana. According to Emmanuel Olla Williams, CEO of Dreamland Sports Plus & Media Consult, the main idea is to create jobs, empower the people to love sports and recreation, and inculcate awareness of healthy living through sports, opening up for tourism and socializing. He said during the festival of Manya Krobo people, there are not many activities to keep the youth busy and hoped that on 23rd October the people will come in their numbers to walk, jog or run for fun and rewards, noting that fantastic prizes like cash, flat screen television, medals and certificates have been put on board for winners and other outstanding performers. According to Olla Williams who is also the Youth Director of the Ghana Olympic Committee (GOC) and had been organizing competitions in various schools and colleges, the half marathon is also to get a champion athlete from the Manya Krobo area who can compete at bigger national and international marathons like the Millennium Marathon. He indicated that the race will start from Akuse and go through Kpong to Odumase and end at Koudjonya Millennium School. He said Ghana sports has gone down and there is the need and challenge for all to work hard to raise sports again. He added that the event is being organized to honour the queen mother of the area. “Let’s run for life” he stressed.